I always enjoy projects that allow for creativity, both in visually artistic ways or utilizing the written word. I also know from personal experience how bogged down I can get in choosing exactly the right picture out of hundreds, so I love the limitations implemented by this program–in building the slides I never felt like I didn’t have enough choices, only that I’d used the wrong search term. This also helped in knowing which words should wind up on the slides. I think Haikudeck is a really good introductory tool, and might help students understand how easy it should be to create a visually appealing slideshow that conveys simple ideas in an easy-to-read format. It might also be good for presenting small projects, where you don’t need to convey as much information as an average powerpoint. I liked how you chose to present where you are from using HaikuDeck. All those places are significant and define who you are. Thanks for sharing. This is great. Thanks for sharing! 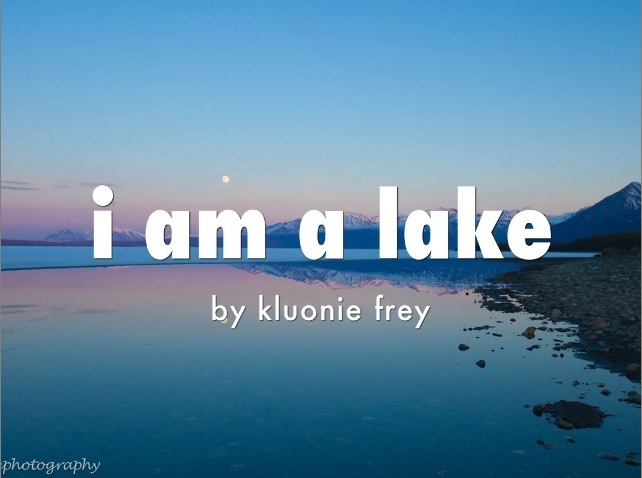 And I love the title- I am a lake. Are you named after a lake– be that the one with a slightly different spelling in the Yukon???? That’s it exactly! My parents really loved the name and the lake, but they were hoping to help people pronounce it by spelling it differently–it didn’t work, but I like it!